Moringa is one of the top 10 appetite suppressant supplements currently on the market. We are very pleased with this product as it contains pure ingredients and has a variety of benefits other than simply suppressing the appetite; it is most definitely, one of our top picks. The product offers customers a simple solution to weight loss, with little exercise needed and results in a short period of time. Not only does the product claim to aid with weight loss, it also provides further health benefits, such as stress relief, healthy living, prevents food cravings, and improves the metabolism. Moringa Oleifera Leaves are commonly used in weight loss supplements, however many debates persist about their benefits to weight loss. They have many health benefits, yet do not directly work towards weight loss. Instead, the high energy and nutrition they contain only works to prevent fatty food cravings and supress the appetite. Moringa Oleifera Leaves – Contain many nutritional properties and plenty of energy. Vegetable Cellulose (Veggie Caps) – Encapsulated in natural vegetarian friendly capsule. Magnesium Stearate – Speeds up the manufacturing process, no benefit to the supplement. Silicon Dioxide – Also helps the manufacturing process, without interacting with active ingredients. The product comes in pill form and is vegetarian friendly. Two of the pills should be taken a day, one in the morning, and a following pill of a night. This should be done thirty minutes before meals along with a glass of water; no other liquids or foods should be used to take this supplement. If pregnant, under the age of 18, breast feeding, or suffering from pervious medical conditions, a health specialist should be consulted before using this supplement. One bottle of Moringa contains sixty pills, which will last thirty days, and is priced at $17.27. Unfortunately no discounts or monthly subscription costs exist for this product. The product contains Magnesium Stearate which has not been proven to have negative side effects, yet debates persist on whether it is good for the body or not and actually needed in dietary supplements. The active ingredient is potent and the recommended dose of two pills a day should not be exceeded. Bio Thrive Labs offer a money back guarantee and claim if you are unhappy with the quality of their product and feel unsatisfied with the results, you can request 100% of your money back and keep the bottle. The guarantee only mentions this, and is unclear on how much time you have to request your money back. There are many customer reviews for the product and the majority of them are positive, praising the product for how well it works and the fast results. However, there are several negative reviews that claim the product failed to produce any results at all. With this said, the positive reviews definitely outweigh the negative ones. Customers only have good things to say about Moringa as the reviews boom with positivity, the additional health benefits of using Moringa Oleifera are also a welcome bonus to this product. The lack of any deal or discount when purchasing the product is disappointing as many supplements often offer several packages. Using Moringa Oleifera for weight loss has also received a lot of negative press recently; with health professionals claiming it should not be used for weight loss. 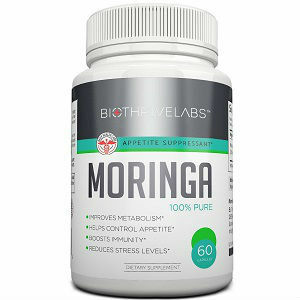 Michael Hall	reviewed Bio Thrive Labs Moringa	on February 23rd	 and gave it a rating of 3.5.